If your teenager has been arrested for a crime of any magnitude, then you are almost certainly a very upset parent. Betrayal, anger, and disappointment are all very common emotions at this stage, but, more than anything, you must be wondering about what is going to happen to your child. This article does not aim to offer any official legal advice, but it does aim to give you a slightly better idea of what to expect as your teen’s legal battle unfolds. Expect more interaction with the police. Depending on the details and severity of your teen’s alleged crime, you should probably prepare yourself for more interaction with the police in the days to come. If your child is the subject of any investigations, the police are likely to stop by your home or possibly your place of work in order to gain insight into the details of your teen’s case. Also, if your teen is being investigated, then, unfortunately, the possibility of arrest cannot be ruled out. Your teen could even be brought to a police station for fingerprinting, mug shots, and other identity documentation. This is all part of the process, however, and, although it is very stressful, there is no need to panic. Try to consider yourself lucky that if your teen had to get into trouble with the law, that it occurred at a time in their life when there was still plenty of time for them to reform and when their adult criminal record would remain unblemished. Prepare for the preliminary hearing. After your teen’s initial arrest or detainment and after charges have been brought against them, it’s time to prepare for the preliminary hearing. If your child plans to plead not guilty at this hearing, then experts advise hiring an attorney as soon as possible. Lawyers act as your ally throughout the legal process, but if you cannot afford to hire one, you also have the option of retaining a public defender. The preliminary hearing is not meant to determine guilt or innocence, but rather to give a judge the opportunity to decide whether or not enough evidence exists to make a case against your son or daughter. It is at this hearing that some lawyers succeed in getting the charges against their clients dropped entirely. If a judge decides, however, that there is credible evidence to support the allegations against your teen, then the next step is usually to move to trial to determine innocence or guilt, at which point you’ll almost certainly want to hire an attorney. If there is enough evidence to potentially find your teen guilty of the crime of which they are being accused, then you should consider seeking alternatives to simply accepting a conviction on their record. 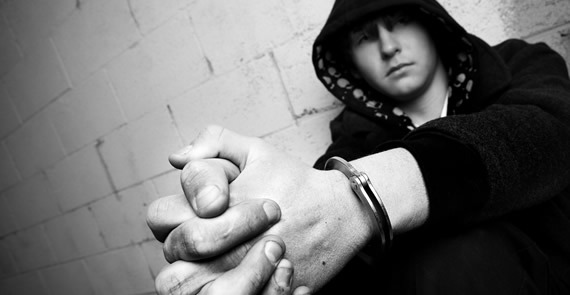 Although juvenile criminal records do not have the same negative weight as adult criminal records, they can still affect your child’s future. Subsequent offenses, for example, are punished more harshly for minors with an existing criminal record. Also, depending on your teen’s age, they could end up being tried as an adult, in which case you’ll definitely want to fight as much as possible to avoid conviction. Talk to your lawyer about arranging a plea bargain of some sort. The law provides for programs that trade things like fines, restitution, and community service on your teen’s part in exchange for reduced or eliminated sentences and charges. These programs exist for a reason: to provide lenience and forgiveness for first time and small time offenders – for otherwise good people who made unfortunate mistakes. If your teen has been arrested, in addition to navigating the legal system to help your child, it is also important for you to consider the possible underlying causes. Often times, drug, alcohol, theft, and violence charges are based in unaddressed emotional or psychological issues, and, if these issues are not addressed, your teen’s criminal behavior could continue.